... lending to private individuals for purposes such as debt consolidation, education, etc. Lending to individuals, on a personal basis, for investment in a trade, business or profession, including lending to purchase a trade or profession, to acquire a share in a partnership, or to finance investment in long-term risk capital ventures. Lending to active partners to invest in their partnership. Lending to directors/employees to acquire shares in, or otherwise finance, their company. Lending to individuals for third-level or other specific educational expenses. It's a bit of a mixture, but it's a handy indicator of the extent to which individuals are willing to have some 'skin in the game', and related therefore to entrepreneurial/start-up behaviour. The bad news is that the rate of decline in Finance for Investment jumped from -11% in Q4 2012 to -22% in Q1 2013. 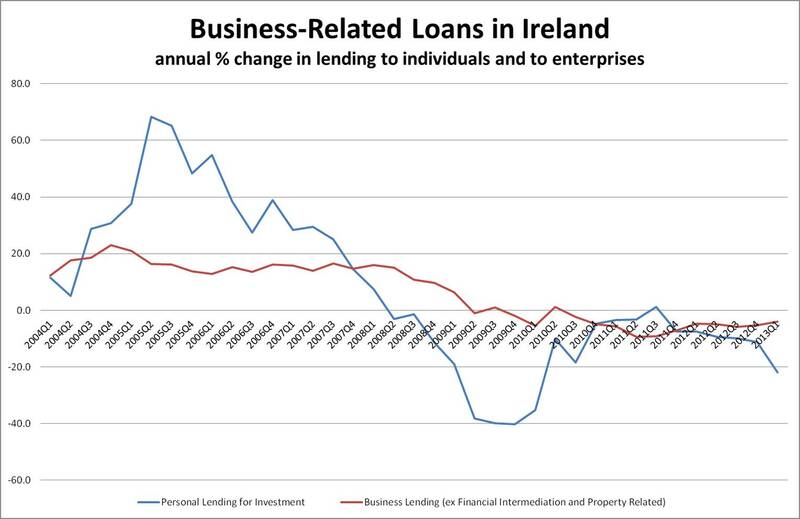 There are many explanations for the trend - ranging from the banks aren't lending to people are prioritising debt repayments. But I think there's something more profound going on. I think people in business (or those thinking about getting into business) are making a rational decision to... do nothing. With a daily news stream of former millionaires being chased around the world for the personal guarantees they gave at the height of the boom, a lot of wannabe millionaires are having second thoughts. Business is personal for most SMEs - the founders and directors are personally liable for most of their debts. And so, therefore, are their families. 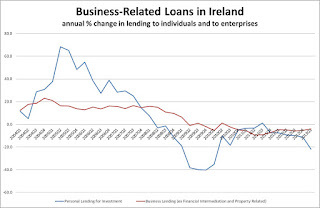 Add to the risk of failure the very high bar required to succeed - when nominal interest rates on many business loans are running at 4-5 times nominal growth in the domestic economy - and you can see why doing nothing might be the most financially prudent course to take. In such a climate, entrepreneurship may be more a sign of desperation than ambition. Just as we have the Paradox of Thrift, we are now experiencing the Paradox of Prudence. With more and more businesses deciding not to invest, hire or expand then the macro-economic consequences in terms of employment, incomes and growth are plain for all to see. Unfortunately, I don't see either paradox being resolved any time soon. I love the engagement rings you sell. I have dropped several hints to the boyfriend about them. Are you going to start new online Business? Get proper Business plan here.